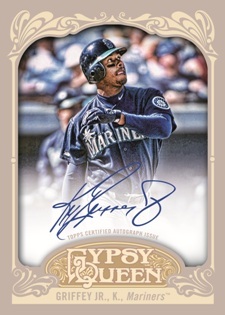 Topps has announced that future Hall of Famer and long-time hobby favorite, Ken Griffey Jr., will have autographed baseball cards in their 2012 products. This will be the first time the 13-time All-Star has signed for Topps. His first cards with the company will be 2012 Topps Tribute and 2012 Topps Gypsy Queen. Since 1989, Griffey was always synonymous with Upper Deck products. From his classic rookie card through to him becoming a company spokesperson, Griffey and Upper Deck were always connected in the hobby. Up until this point all licensed MLB autograph cards of the 1997 American League MVP have come from the single company. Despite having more than 1,000 different autograph cards, Griffey's signature remains one of the most desirable in the hobby. The price ranges vary. Cards with higher print runs can be regularly found for less than $40, while high-end Griffey autographs can run into the hundreds of dollars. With some of the most dedicated collectors in the hobby, when a tough Griffey card surfaces, bidding wars usually ensue. For the better part of the 1990s, Griffey, along with Michael Jordan, drove the hobby. His cards were the benchmark in which all others were compared. Even after injuries stalled the second-half of his career, Junior remained one of the hobby's favorites. 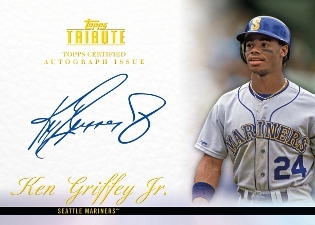 Demand for Topps Griffey autographs will likely be high as it's a fresh canvas for one of the most desirable signatures in modern baseball. 8×10 Ken Griffey Jr Alex Rodriguez dual photo autograph. Seattle Mariners. Mr. Griffy, I’m not much on collecting. Except a lot of great memories of seeing you play for the Mariners at the good old Kingdome. I took my family there about once a month. Good times.